Winding leafy lanes lead you to charming villages and hamlets, unspoilt as if lost in time, where cultural charms, true hospitality and the special flavour of local food can be sampled. Admire the heather-topped hills, sweeping combes, spectacular cliffs, tumbling waterfalls, and rivers in deep wooded valleys. 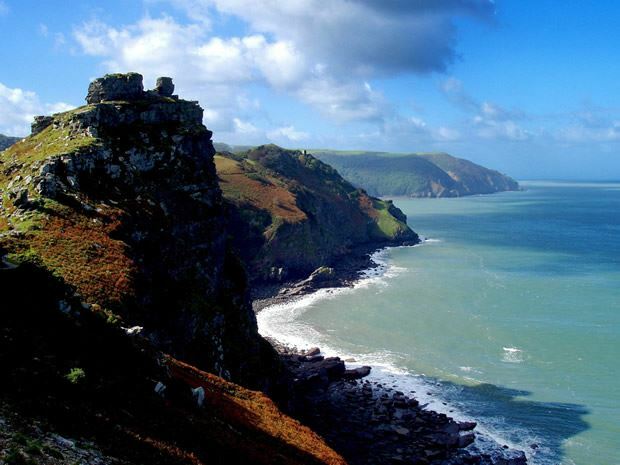 There are castles, gardens, Exmoor’s landscapes, Devon’s sandy beaches, ancient monuments, a remote island, villages locked in the past and more to enjoy. Take in the view from Dunkery Beacon visit Dunster Castle and tour a stunning coastline. Drive through Exmoor via Simonsbath then to Dunster Castle overlooking the medieval village of Dunster and return along the stunning coastline to Lynton & Lynmouth. Go via Dunkery Beacon – 1708 feet above sea level – the highest point in Exmoor with unrivalled views. Visit Stoke Pero church, one of England’s smallest churches or Horner Wood – one of England’s oldest woodlands and a good place to spot the Red Deer. Return via the timeless thatched village of Selworthy or call in at the small port of Porlock Weir to walk to Culbone Church or to watch the sun go down. Stroll sandy beaches, see Damien Hirst’s’ sculpture and visit a haunted house. Explore some of Britain’s best beaches, just over 30 minutes away there’s Woolacombe – one of the world’s top ten beaches – with its huge sandy expanse and its tiny secluded Barricane Bay. A few miles on is Croyde Bay and Saunton Sands, popular surfing spots and then the unique dunes of Braunton Burrows. Return via the coastline to Ilfracombe to see Damien Hirst’s sculpture ‘Verity’ and have a meal at his famous restaurant The Quay or visit intriguing Chambercombe Manor that was the focus of Living TV’s Most Haunted series. Walk over medieval Tarr Steps and visit Dulverton and the Victorian house and gardens of Knighthayes Court. Take the B3223/4 from Lynton through the heart of Exmoor. The route was voted by the Caterham 7 sports club as one of Britains Best Driving Roads, with stunning views of coast and country. Visit the ancient monument of Tarr Steps or visit the Exmoor Pony Centre and then head through the Barle Valley to Dulverton, a charming hunting town. There are many places to stop for refreshments and admire the scenery. Visit the ancient village of Clovelly and the Hartland Peninsula or sail to Lundy Island. Step back in time in Clovelly, a 14th century village still with cobbled streets, no cars, an ancient quay and Court Gardens. A few miles further the Hartland Peninsula is a wonderful rugged headland with Hartland Point, the Quay, Hartland Abbey & Gardens and Docton Mill Gardens to see. Set out towards South Molton and visit Castle Hill Gardens, with its 18th century landscape with grass terraces and statues. Then head towards Torrington and visit Rosemoor, home of the Royal Horticultural Society, this stunning garden is a photographer’s dream. There’s also Broom Hill Sculpture Garden, Marwood Hill, Greencombe Gardens and Arlington Court near to Lynton. Arriving or returning home from the North, Hestercombe Gardens near Taunton is well worth a visit.